This smaller Jet Trails piece was started last summer and was composed with fabrics that had been fused with WonderUnder. 1. Picking out some colors. 2. Starting to lay out some of the trails. 3. More trails and arranging the blocks. 4. It's finished at 36" high X 22" wide. 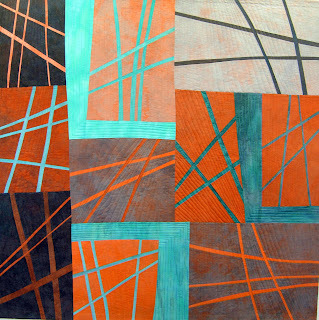 Quilting lines were added to the ends of each of the trails. Beth and Priscilla ventured out to the studio for a little sewing time while the weather was clear and before we braced for another 10 -12 inches of snow. Beth is marking her pattern for her "lions" quilt. 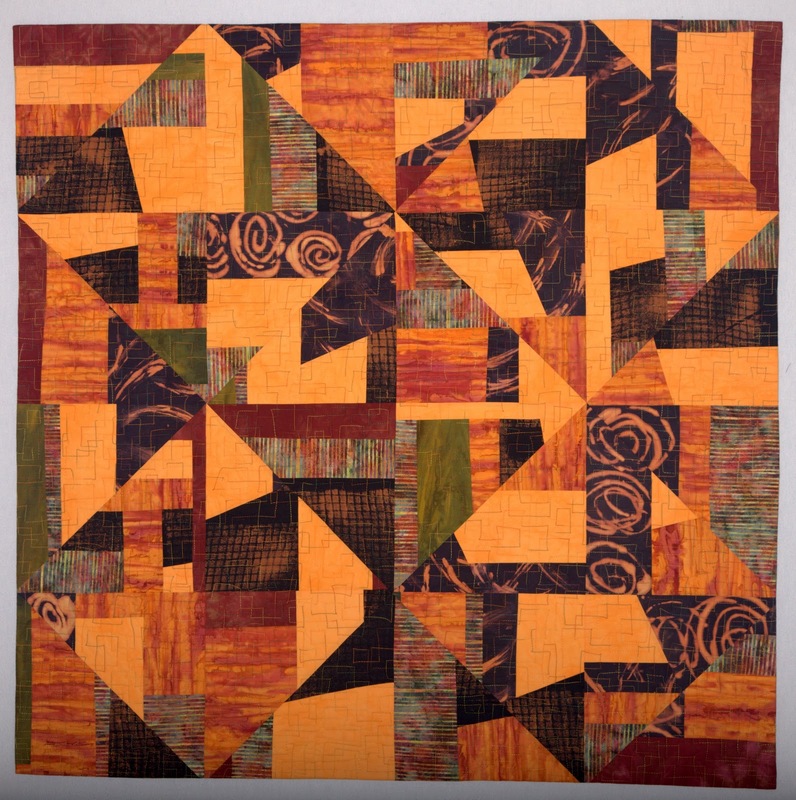 Priscilla has made a good start on a new quilt she's composing from a pattern that she drafted and enlarged. She has a great selection of fabrics to pick from on her table, but we really like the shibori-dyed fabric she has on the wall. When the quilters leave the studio, Inspector Suki feels the need to explore any items left behind. Here, she has jumped into a tall bag that Priscilla left by her table. And, of course, it didn't take long for her to knock the bag over and make it more comfortable for her to see out. It was another snowy day here, which limits her outdoor explorations, but she has managed yet again to locate some indoor possible attractions. Suki settles on top of all spots in the studio. Here she ignores her brown towels behind her and curls up comfortably on a pile of scraps. She would like something to do as she waits for Spring. Inspector Suki settles on top of the warm Drobo (that backs up the computer) as she inspects some of Marcia's latest work. She believes in creature comfort as she goes about her self-decided series of tasks. A male pheasant explores his turf as he stakes out the territory outside the studio doors. Suki watches the process from inside, but shows no desire to contest this invasion on her property. 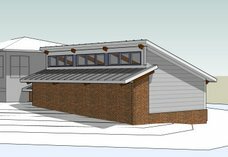 We wonder if the fox and the pheasant will share the same range. We'll see! Beth is back from her time in the sunny South -- both Florida and her beach house in North Carolina. She's working hard on drafting the pattern for her next big quilt, which is inspired by a photo of lions. Priscilla is adding some beading to her wolf quilt -- in spite of Suki's help with keeping the quilt warm for her. And I'm still working on the blocks for my next Jet Trails quilt. These two quilts are leaving next week for Virginia. 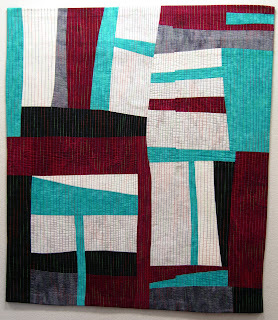 They were juried into the Mid-Atlantic Quilt Festival XXII, and will be on display from February 24- 27, 2011. The first one is "Storm Clouds at Sunrise" (2009 34"h X 66"w), and the second one is "Jet Trails #8" (2009 47" X 47"). 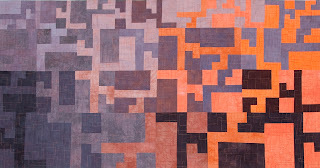 Two other quilts will be on their way to Lancaster, PA, towards the end of the month. 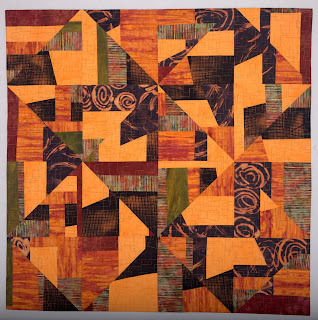 The American Quilter's Society is hosting the quilt show in Lancaster for the 2nd year. 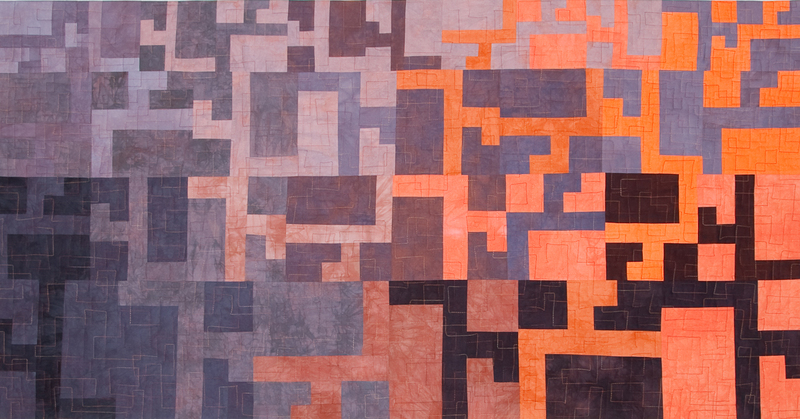 These quilts were juried into the show which will be held March 16 - 19, 2001. The first one is "Five Squares" (2009 52" X 52"), and the second one is Winter Ice 23 (2010 33"h X 29"w).